Many features inherent in the geological structure of the territory of the watershed basin are due to the fact that the territory lies at the interface between the two main lithospheric plates of East Siberia, namely the old Siberian platform, and the younger Central-Asian mobile belt. Formation of the geological structure of both Russian and Mongolian parts of the territory began in the Early Precambrian. For this reason, the geological structures, presented on the map, preserved traces of both Precambrian and Phanerozoic eras of tectogenesis. Precambrian formations have been ascertained essentially within the mountain framing of the Baikal hollow and to the south and south-west of it, within the north-west of Mongolia. The Precambrian sedimentary-metamorphic complexes within the mountain framing of the Baikal hollow, presumably of Archean age, are separated into three series differing in the set of rocks building them up, the degree of metamorphism, the type of magmatic manifestations, and the pattern of fold structures: the Sharyzhalgai, Khamar-Daban and Olkhon series. The occurrence area of rocks of the Sharyzhalgai series in the south is clearly delineated – it is a near-rectilinear shore of Lake Baikal between the source of the Angara river and the settlement of Kultuk, and in the south-west – by the zone of the Main Sayan Fault. Its composition includes rocks of two types: biotite, biotite-garnet and biotite-hypersthene migmatizated gneisses among which there occur, in the form of separate interlayers and thicker bedsets, amphibolites, pyroxene and amphibolite-pyroxene schists as well as granites differing in composition and structural-textural characteristics. The complex of sedimentary-metamorphic formations of the Khamar-Daban series is of widespread occurrence along the southern shores of Lake Baikal and within the confines of the Khamar-Daban mountain range. The composition of the series is notable for the Slyudyanka and Kharangul subseries. The Slyudyanka subseries is comprised of thick terrigenous-carbonate layers (carbonate bedsets, and specific silicious-dolomite apatite-bearing rocks), while the Kharangul subseries is dominated by flyschoid deposits (aluminous slates, and gneisses with rarely occurring interlayers and bedsets of carbonates). Deposits of the Olkhon series occur widely in Priolkhonie and on Olkhon Island; they are represented by marbles, pyroxene-plagioclase crystalline schists, amphibole-biotite gneisses, and magmatites with interbeds of amphibolites and quartzites. The Precambrian ophiolitic complex, confined to the suture zones of the fold belt, is registered in the north-western part of Mongolia. The Lower-Proterozoic deposits of the Muya series are exposed on the watersheds of the Primorskii ridge along the coastal stripe of Maloe More and are represented by quartzites, slates and metamorphized effusives. 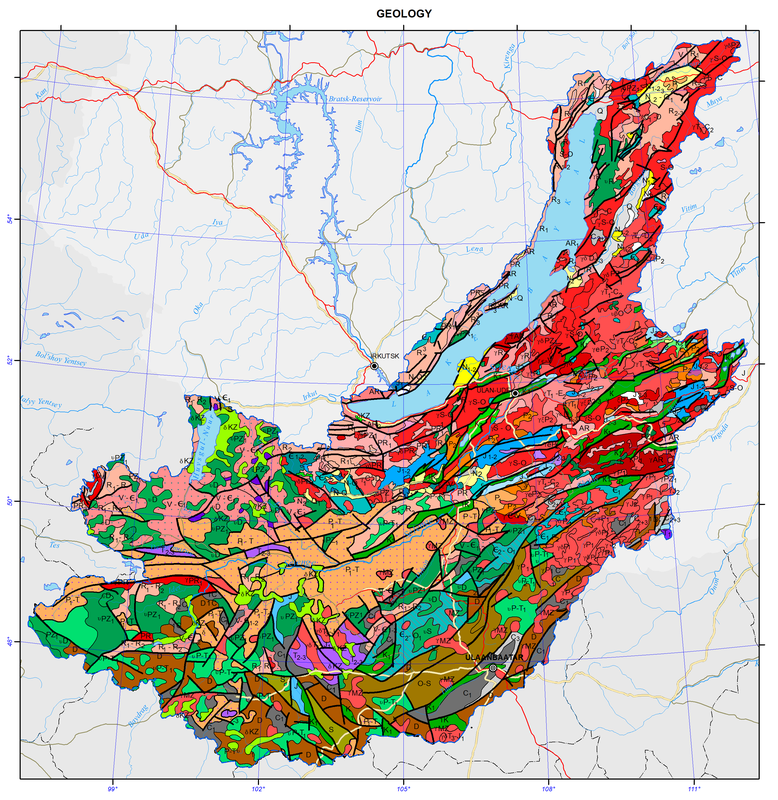 The Upper-Proterozoic (Riphean) deposits occur mainly within the Baikal mountain region. The Patom series occurs in the north of the region and divides into the Ballaganakh, Kadalikan and Bodaibo subseries which, in turn, subdivide into formations. In Western Cisbaikalia there occurs the Baikal series of the Upper Proterozoic consisting of three formations: the Goloustnoe, Uluntui and Kachergat formations. In the south, within the Olkha−Goloustnoe plateau there occur deposits of the Ushakovka formation of the Moty series. Cambrian rocks occur widely in the Middle-Vitim, Angara-Barguzin, and Khamar-Daban mountain regions as well as in the mountain framing of Lake Khovsgol, and within the Uda river basin. The composition of Cambrian deposits is quite varied, ranging from conglomerates and sandstones to very fine carbonate differences. The Devonian deposits are represented by a rather broad spectrum of separate isolated areas; they are arbitrarily subdivided into two stratigraphic complexes. The lower Devonian layers are dominated by carbonate deposits, while the upper level is comprised of terrigenous and volcanogenic-terrigenous deposits. The Carboniferous deposits occur in many isolated areas. The Carboniferous is represented largely by terrigenous marine deposits (sandstones, aleurites, gravelites, conglomerates, and slates). The Permian deposits are also extremely isolated. The largest field of Permian deposits is the Borzya deposit; it lies in Eastern Transbaikalia, and in Western Transbaikalia in the Khilok area. They are represented by relatively uniform terrigenous (and very rarely, carbonate) rocks of a marine and continental origin. The Triassic deposits include widely occurring volcanogenic formations that are assigned to the Dzhida-Khilok series occurring with scouring on Paleozoic granitoids and other rocks. The lower layers are comprised of the Chernoyarovo formation consisting of major effusives, tuff conglomerates and tuff sandstones. The upper layers include the Tamirskaya formation consisting of acid effusives and their tuffs, and aleurites. Sedimentary and sedimentary-volcanic deposits of the Triassic occupy large areas in the western part of Mongolia, where they are interrupted in some places by the Jurassic sediments. The Lower-Jurassic formations are dominant in the eastern part of Transbaikalia, while marine deposits of the Lower- and partially Mid-Jurassic period are found only in the central part of Eastern Transbaikalia. In the north-west and south-east marine deposits are replaced by continental formations. Starting largely in the Mid-Jurassic period, the western and northern parts of Transbaikalia had been accumulating layers of conglomerates, sandstones, aleurites and argillites with interbeds of bituminous coal. The upper division includes covers of acid effusives. Such effusive-sedimentary formations also extend over the Vitim upland. The syncline cores, usually with their north-eastward strike line, occur in the area of Cretaceous freshwater-continental deposits. The lower part of these deposits refers to the Jurassic, while the upper part corresponds to the Cretaceous. The lower Cretaceous layers are comprised of conglomerates, sandstones, aleurites, slates and strata of brown coal, whereas the upper layers include boulder beds, shingle, sands and clays of the Mokheiskaya formation. In the central parts of Mongolia Cretaceous deposits are somewhat controlled spatially by deep faults and unconformably lie on the Devonian and Cambrian deposits. Paleogene deposits occur very fragmentarily and are most commonly regarded as Upper Cretaceous−Paleogene deposits, because their detailed partition is unfeasible to date. They are represented by covers of red and variegated-red clays, sandy-shingle deposits and lacustrine clays. Paleogene deposits are characterized by successive link of their composition with the laterite-kaolinite weathering crust. Miocene deposits of the Tankhoi formation are of widespread occurrence on the south-eastern shore of the lake; they were also found at different depths in the course of drilling in the sediments of the Ust-Selenginskaya depression, within the Barguzinskaya depression, and in intermountain depressions of Northern Pribaikalie. In the Dzhida mountainous area and on the Khamar-Daban range, basalt covers, overlaying the watershed areas, belong to the Miocene. On Olkhon Island, deposits of the Tagai formation, which are overlapped with an angular unconformity by deposits of the Sasinskaya formation (Upper Miocene - Lower Pliocene), are referred to the Lower-Middle Miocene. The Upper Pliocene and Eo-pleistocene in most cases compose a single rock mass, which resists dissection. Deposits of this age are registered in South Baikal (Shankhaikhinskaya formation), and in a number of areas of the eastern, western and southern surrounding of the Baikal hollow. On Olkhon Island the Upper Pliocene is represented by clays of the Kharantsy formation. Quaternary formations are characterized by a diversity of lithogenetic and facial types and occupy different geomorphological positions. Most often, the lower half of the profile of the quaternary system clearly shows a thick, complicated sandy layer, while the upper layers of the Pleistocene and Holocene are dominated by rudaceous deposits, including morainic. The Siberian block of the Eurasian plate and adjoining spaces which, as a result of a long-lasting development, had transformed to the Sayan-Baikal orogenic belt, were characterized by the differing trends of geological events. In the Early Precambrian, the sialic masses that merged together to form a single block, i.e. Siberia, comprised several Archean blocks with the well-developed continental crust. They were separated by proto-oceanic basins. Toward the end of the Early Proterozoic, the proto-continental blocks had formed a massif with a mature continental crust, i.e. a basement of the Siberian platform. As a result of the Early-Proterozoic orogeny, the marginal zone of the continent developed the mountain terrain which had been destroyed by the beginning of the Riphean. The Mid-Riphean stage started to accumulate the proper sedimentary cover of the Siberian platform. At the close of the Riphean−Vendian time, most of the paleocontinent was covered by the sea. On the other hand, orogenic movements resulted in the formation of elevated blocks of the Barguzin and Bokson−Khovsgol microcontinents. They produced a discontinuous chain of mountain ridges separating the Siberia paleocontinent from the Paleo-Asian Ocean. In the late Vendian−early Cambrian, the mountain massifs underwent substantial planation. Starting in the early Cambrian and during the Ordovician−Silurian, the eastern and southern margins of the basements of the microcontinents were represented by shelf zones, and by the upper parts of the continental slope of the oceanic basin. In the latter half of the early Paleozoic and at the beginning of the late Paleozoic, the collision of the Barguzin microcontinent with the Siberian platform triggered the formation of Barguzin granitoids. The latter half of the Paleozoic witnessed the collision of the Barguzin, Bokson-Khovsgol and other microcontinents with the margin of the Siberia paleocontinent. The Paleo-Asian Ocean stretched out southward of the Siberia paleocontinent. In the Hercynian era, the active processes in the Mongol−Okhotsk belt were responsible for the tectonic-magmatic intensification of the Sayan-Baikal region and the southern part of the Siberian platform. At the beginning of the Mesozoic, an attenuation of the vertical tectonic movements led to peneplanation with the formation of a thick weathering crust. The subsequent Mesozoic intensification was responsible for a growth of the mountains in the Sayan-Baikal region, and for an intensification of intrusive magmatism. The end of the Cretaceous−Paleogene was marked by a long-lasting period of peneplanation and crust formation which preceded directly the Cenozoic riftogenesis and the formation of the morphostructural plan of the Baikal Rift Zone and the Baikal basin. The distinguished tectonic stages are very clearly registered in three tectonic blocks in the territory of Mongolia, namely: western – Caledonian; central – Early Caledonian, with numerous outthrusts of rocks of the crystalline basement and Hercynian and Mesozoic structures overlaying them, and southern – Hercynian. In general, the modern overlapped-folded structure of the Mongolian territory outlines certain spatial and temporal patterns, consisting in a directional change of more ancient structures, located in the north and west, by younger ones, clearly manifested in the south. 1. Archean early-orogenic – formation of migmatites and lenticular concordant bodies of gneissogranites and granites. Archean late-orogenic – intrusive bodies of pink and red leucocratic significantly potassic granites and alaskites. 2. Early Proterozoic late-orogenic fissure intrusions of the seaside granite complex. 3. Late Baikalian−early Caledonian (Vendian−early Cambrian) – basic volcanism, ultrabasic intrusions. 4. Late Caledonian (Cambrian−Silurian) – formation of granitoids on a mass scale. 5. Early Hercynian (Devonian) – local occurrence of acid and mixed volcanism. Intrusions of alkali-earth syenites, granites, and alaskite granites. 6. Late Hercynian (Carboniferous−Permian) – intrusive series of gabbro-monzonite-syenite, alkali-syenite and alkali-granite composition. 7. Triassic−Cretaceous – series of tectono-magma activations with the establishment of volcano-tectonic structures, formation of intrusions of normal and alkali-earth granodiorite−leucogranite series and effusion of basaltoids. 8. Quaternary period – riftogenesis and effusion of alkali basaltoids.